Hebden Station Bespoke Finish - Banagher Precast Concrete Ltd.
As part of the Great North Rail Project we manufactured our Banagher Z-panel platforms for Hebden Bridge Station for Story Contracting Limited & Network Rail with a bespoke finish. The panels were hand finished in local stone and the extension was installed quickly and safely during limited rail possessions. The majority of our Z-panel platforms are presented with a concrete finish – because they are safe, quick & efficient to install Network Rail are beginning to use them more widely as they are a very cost effective solution especially where rail possessions are limited. 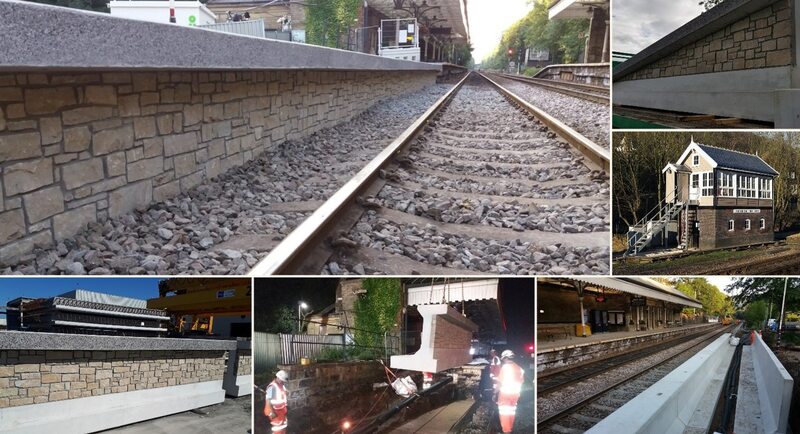 For quality reasons we don’t cast the stone directly onto the panels but instead bring in a skilled masonry team to finish, the overall effect however is well worth the extra time, skill & budget especially for a station like Hebden Bridge.